Over two years ago I wrote that the acquisition of Carl Hagelin changed the identity of the Pittsburgh Penguins. I still believe that to be true, but all good things must come to an end. A deal moving Hagelin out of Pittsburgh may not happen tomorrow, or even before the start of the season but given the team’s shifting roster, and financial limitations, a change of scenery feels inevitable. Hagelin has only played one full season in the NHL; during the 2014-15 campaign, he skated in all 82 games notching 35 points, including 17 goals. His career high came in 2011-12 when he scored 38 points in 64 games. That is only seven points more than he scored last year. Needless to say, general manager, Jim Rutherford did not acquire the Swedish winger to put up numbers on the scoresheet. His speed and ability to drive play are what Hagelin brings to the table. Malkin’s Corsi rose to 55 percent with Hagelin. It was 49 percent without. Hagelin and Malkin took 56 percent of the shots and scored 61 percent of the goals. Separate, the Penguins scored less than 40 percent of the goals. For all of the expensive veterans on the Penguins roster, there is a bit of a youth movement going on. 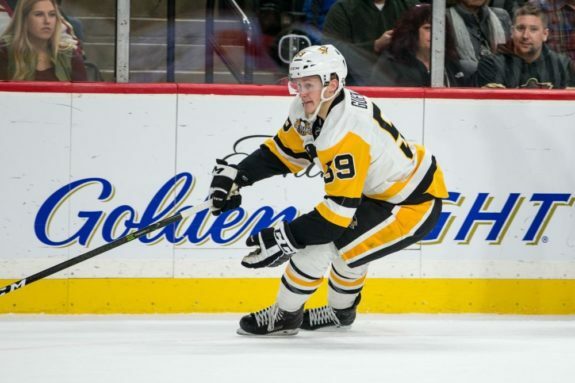 Jake Guentzel, Zach Aston-Reese, Dominik Simon, and Daniel Sprong are all under 24 and will be afforded the opportunity to have a prominent role on a championship-contending roster this season on relatively inexpensive contracts. But that will not be the case forever. Guentzel and Aston-Reese will be restricted free agents after this season and if they perform well, they will get significant raises. 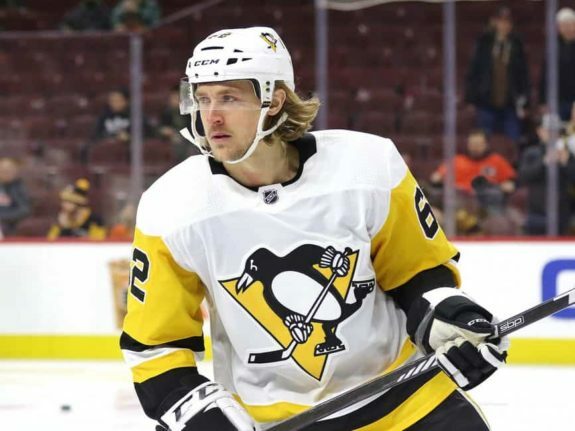 The Penguins have very little wiggle room on the balance sheet and Hagelin, who already has a cap hit of $4 million, will be looking for a raise as an unrestricted free agent next July 1. If the youngsters play well, there will be an abundance of capable wingers, making Hagelin the most logical salary dump. The speedy forward will also be 30 next season and the Penguins already have eight regulars over that dreaded age. Advancing age, increasing salary, and encroaching competition are all indicators that moving Hagelin makes sense. The Penguins roster feels like an unfinished product and when you consider what parts could still be in motion, Hagelin comes to mind. Obviously, Sidney Crosby and Evgeni Malkin are not going anywhere. Phil Kessel is always a wildcard, but for the moment looks safe. Patric Hornqvist just got a new contract and wields a skill set that no one else on the team has. Bryan Rust, Riley Sheahan, Sprong, and Simon also just got new contracts and have important roles to play. Aston-Reese is a cheap forward with great potential while Derek Grant and Matt Cullen were recently signed during free agency. Derick Brassard has been discussed in trade rumors but given the talent drop off after the former Ranger, moving him isn’t in the team’s best interest. Those are all of the Penguins’ forwards so if someone needs to go, the arrow is pointing at Hagelin. After the season ended and trade rumors started swirling, Hagelin, Conor Sheary, and Kessel were among the most rumored to be moving on. Sheary was traded to the Buffalo Sabres, and Kessel appears to be safe at the moment. That leaves one person still in the mix. I have a ton of respect for Hagelin and his game but by the process of elimination, the speedster appears to be on his way out.